Every Friday from 10AM - 12PM Younger Children just can't get enough bouncing, and Preschool Playdate gives them a chance to come back every week. Nothing could be better than having a chance to laugh, socialize, and get a little exercise, and our experienced staff is on hand to supervise at all times. as long as they 're old enough to walk, they'll enjoy our music, our games, and all the bouncing they can handle. Ages 6 & under Only. Snack Included. 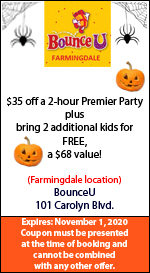 Book your next party and use our coupon to save $$$!